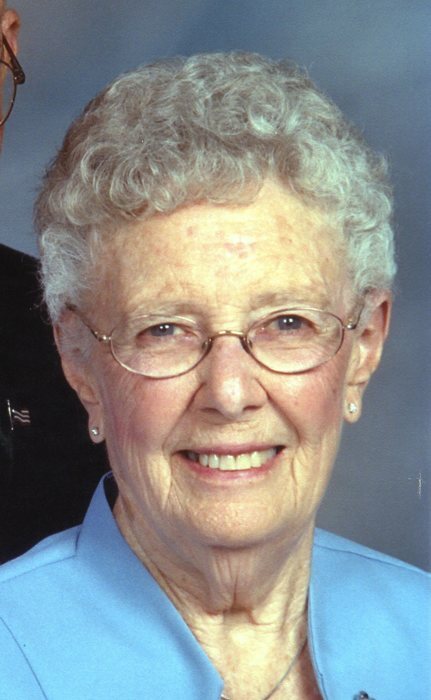 Funeral services for Ann M Praeuner, 90, of Battle Creek will be 10:30 a.m., Saturday, August 25, 2018, at St. John Lutheran Church, Battle Creek: Reverend B J Fouts, will officiate. Burial will be in St. John's Cemetery, Battle Creek. Visitation will be Friday from 4-7 p.m. at the church. Steffen mortuary is in charge of arrangements. Ann died Thursday, August 16, 2018 at Community Pride Care Center. Ann Marie (Heybrock) Praeuner was born on July 26,1928 to Henry Heybrock and Anna (Laaker, Diduneyer) Heybrock on the family farm at Arlington, NE. She was Baptized at St. Paul's Lutheran Church, Arlington, NE. on August 12, 1928. In 1934 she moved with her mother and brothers Martin and Herbert to a farm near Hoskins, NE. There she attended country school. The family then moved to Battle Creek, NE. where Ann attended high school and graduated in 1946. Following high school, she worked at the Battle Creek coop as a secretary. On September 14,1947 she married Carl Praeuner at St. John's Lutheran Church in Battle Creek, NE. They moved to the family farm where all three boys were born. In January of 1956 the family moved to Neligh, NE. where Carl started a new career selling Farm Bureau Insurance. Ann was the Grace Lutheran Church secretary for 30 years. She was also the assistant organist for the church. Ann was also active as a Sunday School and Vacation Bible School teacher. They moved back to Battle Creek, NE. in the fall of 1990. Ann is survived by three sons. Rev. Daniel (Patty) Praeuner of Caldwell, ID. Randy (Belinda) Praeuner of Battle Creek, NE. and Roger Praeuner of Denver, CO. Also survived by four grandchildren and nine great grandchildren with another great grandchild expected in February. Ann was preceded in death by her husband Carl, brothers Martin and Herbert Dickmeyer, sisters Etta Bierman and Lenora Smith, daughter-in-law Roxanne Praeuner.